Recently I ran into an old friend. I don't see her very often, but I hear about her through the grapevine from time to time. She is a lovely person with a great family and many talents. She and her husband are also quite wealthy. They own at least two multi-million dollar homes (I think there's also a large cabin out there somewhere), they travel the world on a pretty regular basis and drive very nice cars. But if you just met her at the grocery store, you would really never know they were loaded. They don't talk about their possessions or travel and don't dress in an expensive way either. They are just good people -- even their children are delightful, which I think is a quite an accomplishment when you have lots of money. 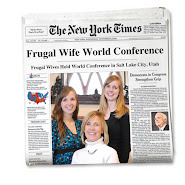 A few years ago, a mutual friend mentioned that this family earns about $3,000,000 per year. I did the math and that works out to $250,000/month! Of course, they lose probably half of that to the IRS, but still. That's a lot of moo-la. I find it interesting to see what people spend their money on. If you had millions to spend, what would you do with it? Would you be quietly generous? Would you flash it around in certain ways? Would you just buy stuff just because you could? I hope I would be frugal still and be a good steward with what I had. I know I would travel. And I'd probably still watch for cheap fares and good deals at hotels. In that vein, here is a interesting blog, Help Me Travel Cheap, that I recently found that helps those of us who are still working for a living, travel the world without breaking the bank. Being able to travel and experience new places, makes me feel like my life is wealthy. Maybe you feel that way too. If I was wealthy I would . . .travel, buy a home outright, by my mom a home, and make sure my father had access to the best possible medical care. And, I imagine I would indulge my taste for expensive accessories a lot more too! If I were wealthy I would travel too, but I would spend significant amounts of time in a place. I'd immerse myself in the culture rather than eating it up. I'd buy a modest home outright (but nothing too ostentatious). Our family would have a second car. I would finance a missionary a month. I would pay for schooling for my siblings. I often dream of being wealthy, but I don't think it would change my lifestyle too much. Sure, I'd drive a newer car and pay off debt, but I don't think I'd live extravagantly or brag about it. a) Pay off my mortgage, move out of a condo and into a real house with land and never take out another mortgage again. b) Be a secret philanthropist. It's been a dream of mine for years. Live so that no one realizes I'm rich, and secretly give to charities, etc. c) I'd travel more, for sure. I love traveling. d) Cook more. And with fancier foods. I'd pay off my and my boyfriend's school loans. I'd buy a house in the hill country in Austin to serve as my home base, and then I'd travel the world. And I'd definitely squeeze in a trip to the Harry Potter theme park. And I'd bring my sister with me on the travel. Mainly, I'd make sure that everything was set up so that my MIL and FIL, my dad, (maybe even some other relatives and friends) and then my husband and I would never have to go to an assisted care place or nursing home. Not wealthy yet. In many ways, I think being wealthy would be just as much of a burden as having to work full time to support our family. Which makes it that much easier for me to enjoy the present, when we clearly are not wealthy and don't have to worry about what to do with all of our "extra" money. I've always loved the idea of living a frugal life in a medium-sized home with non-flashy cars, with extra money to travel and be generous and support worthy causes. I'd love to help fund someone's biking trip around the world or other random and interesting things. But really, I feel wealthy as it is. We don't have a lot in comparison to "wealthy" people out there, but man do we have a lot. A comfortable life, travel opportunities, delicious food, nice enough clothes, a great car that has lasted a surprisingly long time (knock on wood), awesome friends and lovable family, and most important, our iPhones ;). I would share it quietly and often. I would use it to help people that really need it. I would be totally debt free and I would take care of my good friends and family. And I would travel. Thank you so much for blogging about this :) I am so excited to read your blog and this one! I would donate to each of the babies on www.reecesrainbow.org and see them go to loving homes! We donate now and see the effects but can't wait until we have more to give more!